As an added bonus, the user can now color any monosaccharide according to the SNFG scheme by simply choosing the ResName option for the Coloring Method. After the 3D-SNFG script has been initialized (by pressing ‘g’ or ‘i’), the colors for each residue recognized within the 3D-SNFG script are assigned internally, and may be applied to any Drawing Method (i.e. licorice, VDW, etc.). Please note that solely applying color without shape loses information about the monosaccharide type. For example, the color of Mannose is the same as Arabinose according to the SNFG. Therefore, the colors should be explicitly defined in any figures that lack the SNFG shapes. 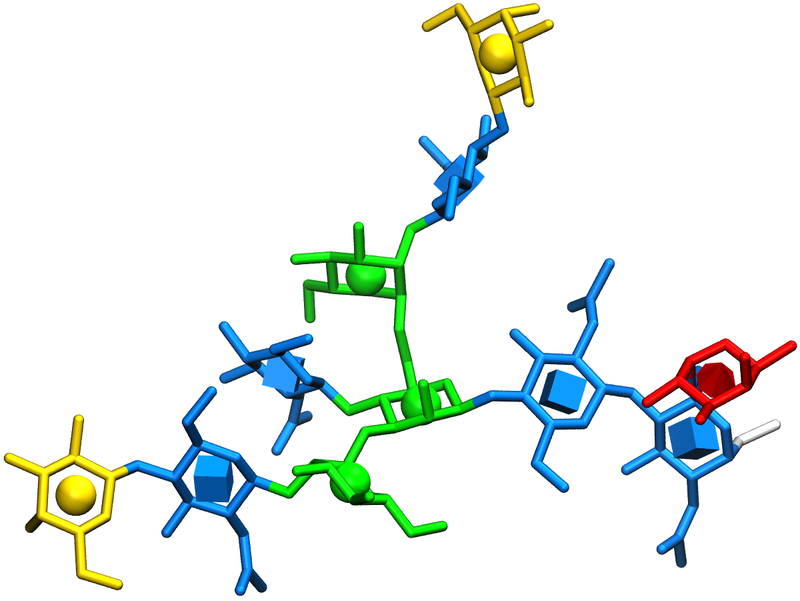 Alternatively, consider using the 3D-SNFG Icons representation to convey both glycan sequence and atomic interactions. Solely applying SNFG colors would not differentiate between the residues on either side of the glycan. Furthermore, shapes that require two colors (i.e. IdoA, FucNAc, etc.) are not possible with this style. In this situation, the base base color is applied (i.e. tan for IdoA and red for FucNAc).